I was keen to get your opinions on this image. I want to see how believable it is, given that I had to post-process it a little and deliberately shoot it with that in mind. I haven't posted how I have done this just yet, but will give interested punters the chance to reverse engineer etc. I think this will give a nice little break from all this talk about filum and other ridiculous entities.... Also this would give some prelude to the post-processing workshop that Matt is going to organise. Comments welcomed as some would say, good, bad, fugly etc. Thanks for looking. Last edited by surenj on Mon Apr 09, 2012 2:06 am, edited 1 time in total. I don't think "believable" is a word you will ever use with images like this. Nor should you have to though. There's nothing wrong with knowing that an image is a composite. Take Tanya Rochat for example, all of the parts of her composites are real, but you'd never think the finished image was ever real. That doesn't detract from the fact they're great images. This looks like a screen grab from a game and that's not a bad thing. Well done! 1. DOF doesn't appear consistent. 2. 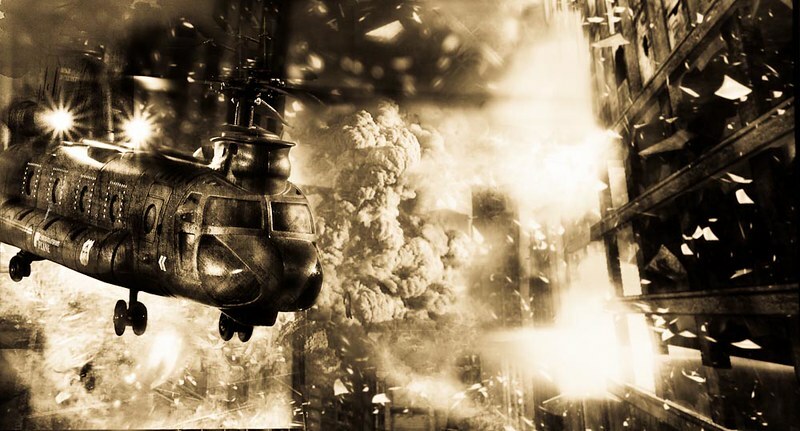 The reflection of the explosion on the front right of the helicopter doesn't make sense. 3. The explosions don't look real enough. Like I said, this is to answer the question of believability, not about the quality of the image produced, which is top notch. Cooool! It looks a little too clean....try placing some dry ice in the background, (or blow in some smoke), to add to the deception. Could make a big difference. The building on teh right is probably the best bit, it gives some depth to the image and leads teh viewer, i think more of this would help. This looks like the cover of a video game and hats off to you for that. check this youtube video of a CH-47 ground resonance test, a oldie but a good one.. there is something satisfyign about seeing a good aviation machine being ripped apart by physics..
biggerry wrote: there is something satisfyign about seeing a good aviation machine being ripped apart by physics.. I haven't bought one yet.... Most of them have the back part bare to save weight so looks naked. Might do a different version when I get one though. Does anyone have an Apache I could borrow for a few days? biggerry wrote: This looks like the cover of a video game and hats off to you for that. Done; In the dark room rather than real stuff as the physical living conditions don't necessarily permit such shanighans....Wish it did. Reschsmooth wrote: 1. DOF doesn't appear consistent. 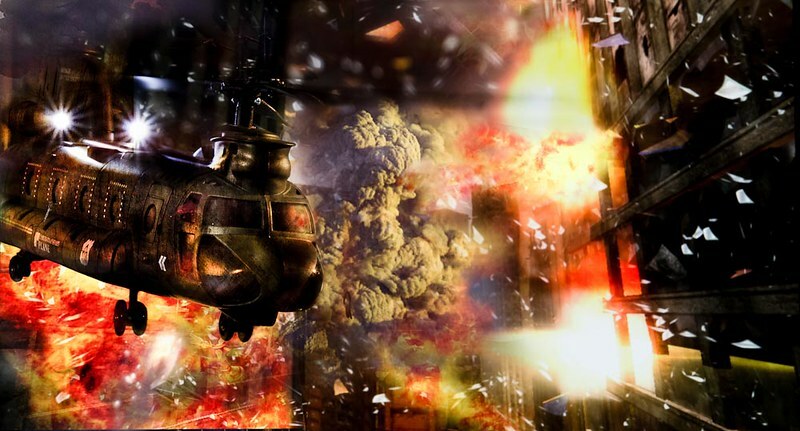 Reschsmooth wrote: The reflection of the explosion on the front right of the helicopter doesn't make sense. Reschsmooth wrote: The explosions don't look real enough. Noted. 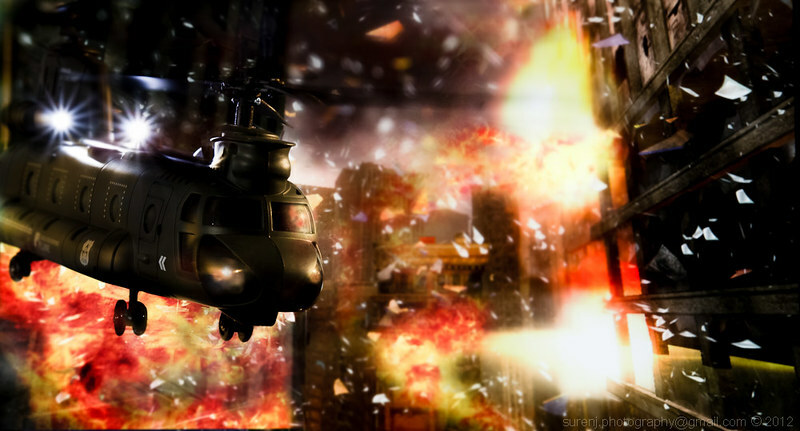 Too much trouble to correct now as I shot that copter and explosions at the same time to avoid too much masking. Wink wrote: This looks like a screen grab from a game and that's not a bad thing. Well done! Remake #1 is a huge improvement. The chopper is much more realistic. Thanks Adam for the followup. Your skills have improved dramatically, surenj. 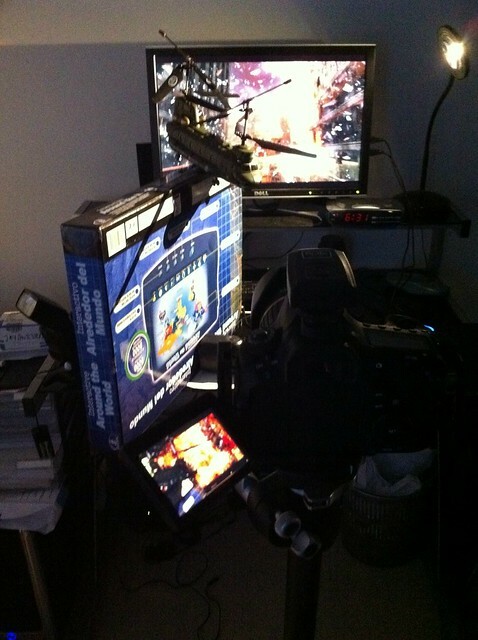 Are you looking for a job in special effects? Great work...that video that Gerry posted was a nice distraction as well! You have put in some time and skill, really well done. Loved both videos. This is a prime example where the final refinements are the key ones. Thanks for the followup feedback. For the record, I think it was very useful that I used a mostly non destructive technique as the suggestions on reflections etc were easy as clicking once to remove it. You can see me doing it in the video as per Patrick's suggestions. I think there is one more reflection that I forgot to dial down. The final file is more than 500Megs so became a PSB file. Its because of the smart layers and filters I assume. Finally, this is the BTS lighting diargram. There is a LED desk lamp doing a bit of continuous lighting from the camera right (for the spinning rotors - while I held it down - this thing is violent when activated). The speedlite is doing a reflected number to bring out the camera left side generally without hotspots. As you can see, the explosions were already on my LCD monitor as the backdrop, saving me from doing masks to put it in later.